I have been talking about how dry our O. C. Fisher lake was. Now here is proof, with these aerial photos that were taken and sent to me. All that is left is that puddle of toxic water that is standing outside the outlet. 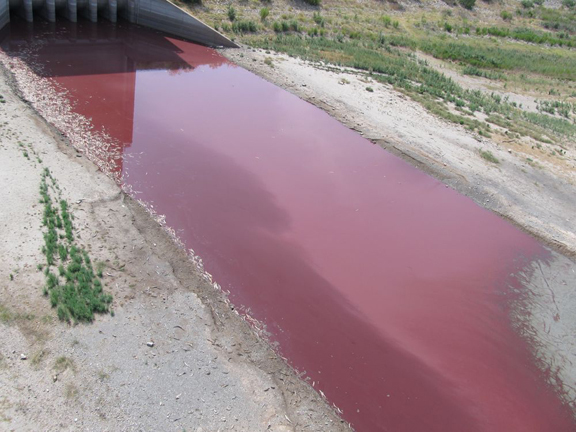 Please notice all of the fish kill that has taken place. The gray area you see is dry lake bed. You can see the high water mark on the concrete building where the lake level once was back in the mid-sixties. Then it gradually dropped down to the level just above the outlet openings where it stayed until about a year ago when this latest drought started. I have been going through some photos of some of the wildlife that used to be in abundance at the lake. 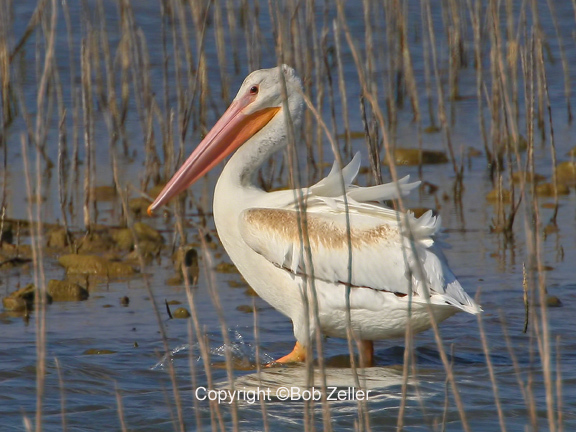 This is an image of an American White Pelican. We probably won’t see any of them for awhile. It was while I was taking this photo that a Northern American Bobcat rushed by within 4 feet of Ann, who standing behind me, and nearly knocked her down. It was chasing a Jackrabbit, and probably didn’t notice us. Canon 500mm with 2x tele-converter – tripod mounted. I hoped you enjoyed the photos. Click on any of them to see enlargements. This entry was posted in Birding and Photography and tagged American White Pelican, big bend, big bend national park, Big Bend Ranch State Park, Bird, birding, birds, blog, blogging, bob zeller, bobcat, Canon EOS 7D, great blue heron, nature, nature blog, Photograph, photography, photography blog, san angelo, san angelo state park, San Angelo Texas, state park, texas, texas tweeties, United States, wildlife. Bookmark the permalink. Catching up on your posts, admiring your finds very much. This one sent me off on a quick Internet search of the reservoir and Concho River. It is very sad that your are going through this severe drought and so many species are being affected. How is San Angelo coping domestically water-wise? As of today, San Angelo has received only 2.94 inches of rain this year. From our other water souces, we only have 23 months of water left. 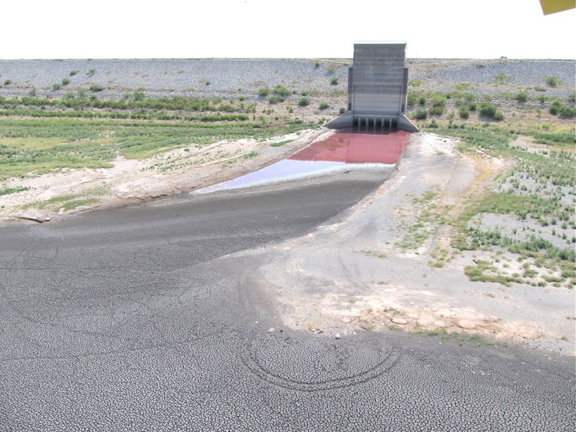 One source is Lake Ivie, a large reservoir about 40 miles away, and it is evaporating fast. We receive water from there through a pipeline. In town, we are only allowed to water our lawns once per week, and that must be done before noon. But west Texans know how to survive, so somehow we’ll make until the heavens open up and the rains return. Here in Austin many of the creeks and ponds where I’ve photographed in other years have partly or fully dried up. One compensation is that some fringes of land that used to be under water are now covered with growth that give me something new to photograph. Like you, I’m using an EOS 7D, but as you know all too well, it takes some heavy-duty equipment to get good bird pictures, so I haven’t gone that route. Instead I photograph primarily plants rather than creatures, often with a 100mm macro lens. Thanks for commenting, Steve. You have some great photographs on your blog. I think that all the flora out here is pretty dried up. By the way, my favorite lens for the birds is my Canon 100-400mm zoom lens. It is an L series, tack sharp. The beauty of it is that with the 18MP of the 7D, you get that large file so you can really crop in tight. I use it for flowers, mainly my water lilies which you can see in my portfolio. The nice thing is that you don’t have to be real close, just put that center focus point on the flower, select you aperture to your liking, and fire away. It sells at B&H Photo for around 1400.00 I think. That’s for sure. If you will look at the water outlet building, you can see the high water mark of where the lake level was when full, back in the mid-sixties.